AT&T announced its new international mobile data plans on Thursday that will be available on June 1. Customers who travel abroad will have three new data packages to choose from: $30 per month for 120MB of data, $60 per month for 300MB of data and $120 per month for 800MB of data. AT&T will charge you an additional $30 for 120MB of data if you exceed your initial allotment, which isn’t too bad considering that AT&T’s old setup charged $10 per additional 10MB. These new plans may be too rich for some people’s blood, but they’re definitely useful when the use of international data is a must. If you’re an AT&T customer with travel plans in your not so distant future, you can find more intimate details about these new plans via the press release below. The overage rate for all packages is $30 for 120MB. AT&T is streamlining its international data offerings while giving customers more data per bucket. All three international data packages are designed to give customers the freedom and flexibility to use their smartphone, tablet or laptop to stay in touch via email, update their status on popular social networking sites and enjoy convenient access to information such as maps and directions, without having to search for a Wi-Fi hotspot. AT&T’s wireless customers enjoy a robust selection of world phones and international discount data, messaging and voice packages, along with the best global coverage of any U.S. wireless provider2. With voice service in more than 225 countries, AT&T customers can travel around the globe and make and receive calls on the same wireless number they use at home. For more information on other AT&T international services, including discount packages for messaging, voice and international long distance services, as well as travel tips, visit www.att.com/global. 1 The new AT&T Data Global Add-On packages provide discounted data rates in 135 countries. Outside of these countries, pay-per-use rates apply. Visit att.com/globalcountries for a list of included countries. 2 Best coverage worldwide claim based on global coverage of U.S. carriers. Activation of international service required. International roaming rates apply. Availability, quality of coverage and services while roaming are not guaranteed. For countries, rates and additional details, see att.com/global. 2 The new AT&T Data Global Add-On packages provide discounted data rates in 135 countries. Outside of these countries, pay-per-use rates apply. 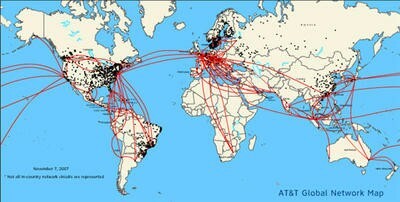 Visit att.com/globalcountries for a list of included countries.